This 5 1/2-quart electric steamer has two tiers that stack for cooking then nest for more compact storage, so it’s both large and small. You can use just one tier for cooking when you don’t have as much food to cook, or use both tiers when you’re cooking for a crowd. The tiers have a removable center divider, so you can keep the broccoli from frolicking with the carrots, or remove the divider to cook a large filet of fish. The rice bowl can be used for rice or for other small foods that need to be contained, like peas or corn off-the cob. When cooking is done, the steamer automatically switches to a keep-warm setting for one hour before turning off to avoid overcooking the food. Speaking of settings, there’s a digital touchpad that makes controlling the cooker easy. 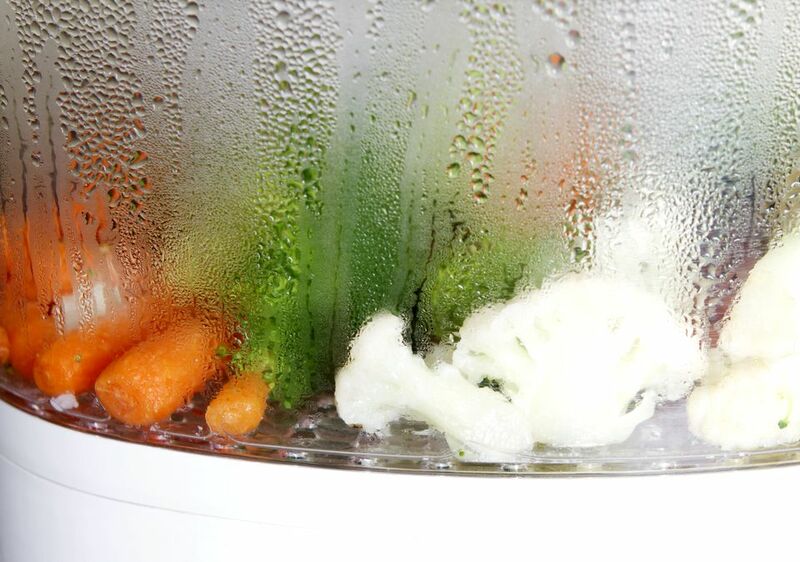 The delay-start feature lets you fill the steamer with produce in advance and start the cooking later. This feature shouldn’t be used for highly perishable foods like fish, poultry, or meat. This steamer includes a drip tray and rice bowl that are dishwasher safe. The food containers should be hand washed. If you’re not sure you’ll be steaming enough food to warrant a high-priced appliance, this 5-quart steamer has plenty of features and a budget-friendly price. It has two tiers with transparent steaming bowls for cooking foods separately. The timer can be set for up to 60 minutes, and the steamer turns itself off when time is up. For safety, it will also shut off when the water reservoir is empty. There’s a power indicator light that shows when the steamer is on, and easy-to operate controls for setting the cooking time. The food bowls are top-rack dishwasher safe for easy cleaning, and they nest for more compact storage. If you don’t like the idea of cooking in plastic, this steamer has a five-liter glass cooking pot, a stainless steel steaming tray and a glass lid with stainless steel trim. All parts are dishwasher safe for easy cleaning. The LCD control panel includes start/stop, pause, and reheat buttons along with pre-programmed food setting to make cooking easy. You can also set the controls manually, for custom cooking. The steaming system delivers the steam from the top down, surrounding the food and cooking it quickly and evenly. The water tank is removable for easy filling. Two handles on the steamer tray make it easy to remove the cooked food. This is available with either stainless steel or white exterior trim. This 9 1/5-quart steamer has three stackable trays to hold more food, as well as a rice-and-grain steamer accessory for cooking small foods. It has a digital readout for setting cooking time or for programming cooking in advance and the water tank is designed to make it easy to see the remaining water at a glance. The steaming trays can be used all at once, or one at a time. For egg steaming, each tray has six indentations for holding the eggs during cooking, for a total of 18 eggs per batch. When cooking multiple trays of different foods, items that need the least cooking should be on the top, since steam rises from the bottom. The trays are dishwasher safe, and a recipe booklet is included. This steamer insert fits onto just about any 2-, 3-, or 4-quart saucepan, including pots with straight sides and those with tulip-shaped pots. The steamer rests on the sides of the pot, so the food in the steamer bowl remains well about the simmering water. 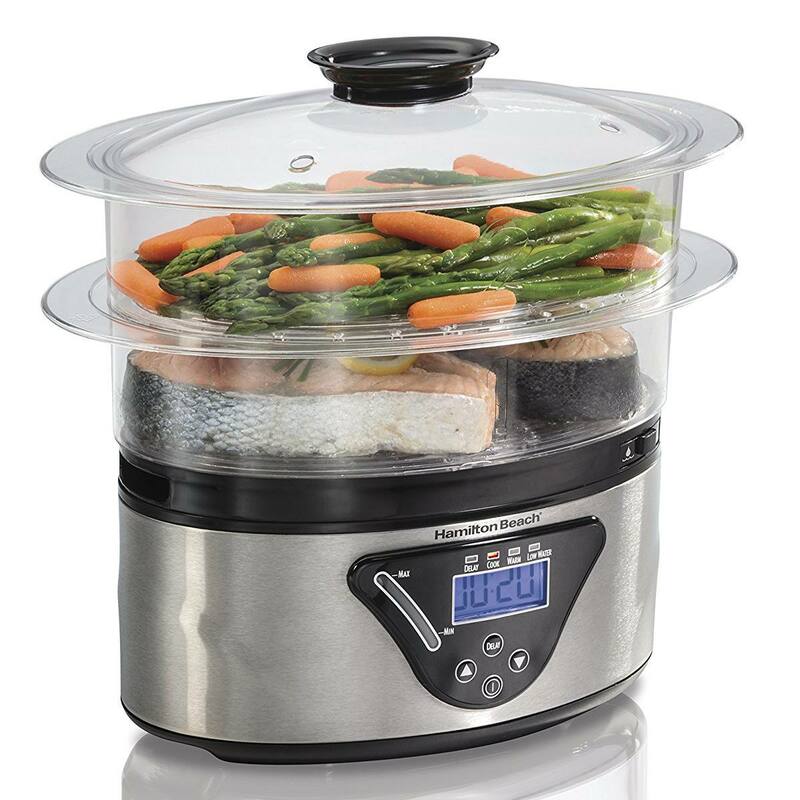 The steamer is made from stainless steel and has a shatter-resistant glass lid that fits snugly and keeps the steam contained while also allowing you to peek into the steamer to watch the progress of the cooking. The steamer and lid are dishwasher safe. If you have a use for it, the steamer is oven-safe to 500 degrees. If steaming sounds like a great idea, but you’d prefer an appliance that has multiple uses, this steamer can also be used as a food dehydrator. You can also cook rice, steam meats or vegetables, braise meats as you would in a slow cooker, or dehydrate fruits, vegetables, and herbs. There are four stackable trays to hold layers of foods for drying or steaming, and a three-quart rice bowl. The tiers are shallower than those in the steamer-only units, so you might not be able to stack the tiers if you’re cooking large foods, but sliced foods and shorter ones will fit just fine. The controls are simple, just for steam, dehydrate, or off. There is no timer. If you don’t want another appliance on your counter, this silicone steamer will fit into pretty much any pot, and it has a sturdy base that won’t tip over. The handles make it easy to lower food into the pot. For safety, use tongs to grab the handles and lift the steamer out of the hot pot. Not only can you use this steamer on the stovetop, but it also fits neatly into an Instant Pot or other electric pressure cooker, multi-cooker, or rice cooker. The handles lock together to keep them out of the way when you seal the cooker’s lid. Silicone is naturally nonstick, so it’s easy to clean, and it’s dishwasher safe, too. For even more versatility, it can also be used in the microwave.